Are your kids in the 'book band' stage of childhood? Boy, was I glad when that stage ended with Girl Child. 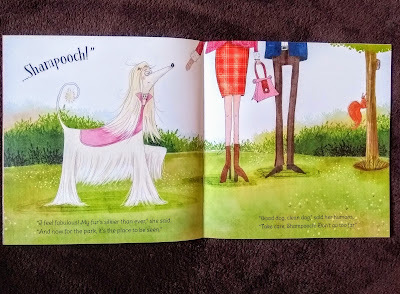 As much as I have a fondness for Biff, Chip and Kipper I think we can all agree that early reader books aren't always the most inspiring children's literature you'll ever read. It's understandable really, I imagine to qualify for a particular book band the author has to work to fairly rigid rules which isn't exactly conducive to creativity. However, I recently received a set of 10 early reader books from Maverick Children's Books and was pleasantly surprised by them. Unlike many of the offerings that have come home via a book bag in the last three years, these stories are funny, quirky and a joy to behold. What struck me immediately about these books, which cover book bands purple, white and gold, was the variety of themes contained within them. 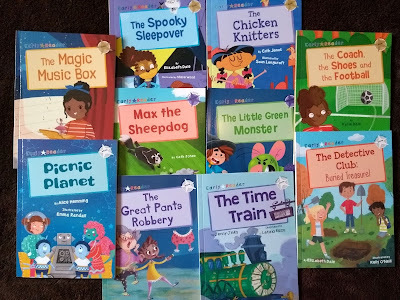 A lot of early reader sets follow the same characters or fit into a similar genre. However, in this set the books are all self-contained and cover different topics and genres, from a ballet story to detective fiction and several funny stories too. Each book is like a taster of a different genre, which is great for discovering what your little one is into. I won't go through every book as that would make for a very long post, but I think my favourite one is 'The Time Train'. I love a bit of time travel and thought this story was really clever, exploring different eras in a humorous way. I also enjoyed the reinvention of the Cinderella story in 'The Coach, The Shoes and The Football' and the funny antics of the 'Chicken Knitters'. All of the books include the bright, bold and witty illustrations that are a hallmark of Maverick's style, and that complement each story beautifully. Obviously the illustrations are smaller and therefore simpler than in picture books but they are still packed with character and detail to keep the reader interested and engaged with the story. Despite having moved on from reading schemes a few months ago Girl Child was still happy to read through these books which surprised me as she's usually quite resistant to reading anything she thinks she's too old for. We even had to tell her to stop reading them because it was mealtime!! It'll be a while before Preschooler is ready for these obviously but I'm definitely going to put them away for when he's older to liven his reading material up! DISCLAIMER: I was provided with these books by the publisher for this review but my words and opinions are all my own. Linking up with #ReadWithMe hosted by Mama Mummy Mum and Kids Love To Read #KLTR hosted by Laura's Lovely Blog, Acorn Books and BookBairn. 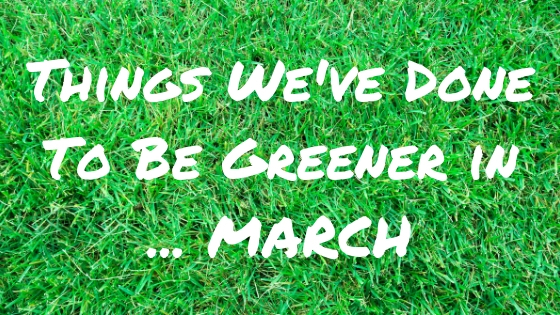 I started this monthly green living series almost a whole year ago, looking back on last April. So this post completes the set! 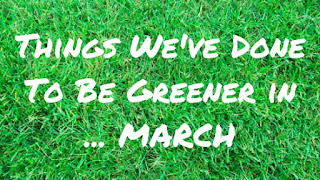 I had hoped to go out with a bang, with some really big and impressive green acts, but as I mentioned in my last post, March was a tricky month. But actually, this series was always meant to be about the little things we can all do to be greener, so perhaps it's fitting that my eco-achievements this month have been rather modest! OK, this is actually something we started before March, but it definitely became handy in March when Preschooler developed a popcorn obsession. We used to get those bags that you put in your microwave to make popcorn but the amount of packaging is ridiculous! Once again, our local zero waste shop came to our rescue as they sell popping corn. So now we can put some in a microwaveable (lidded!) container with a knob of butter, whack it in the microwave for a couple of minutes and voila - fresh, warm popcorn with hardly any waste! I can't say zero waste because I've still not got the knack perfectly and end up with some burnt bits and unpopped kernels, but definitely better than the supermarket alternative! I don't know about you, but what with the cold weather and the pollen we got through a lot of tissues in our house last month! 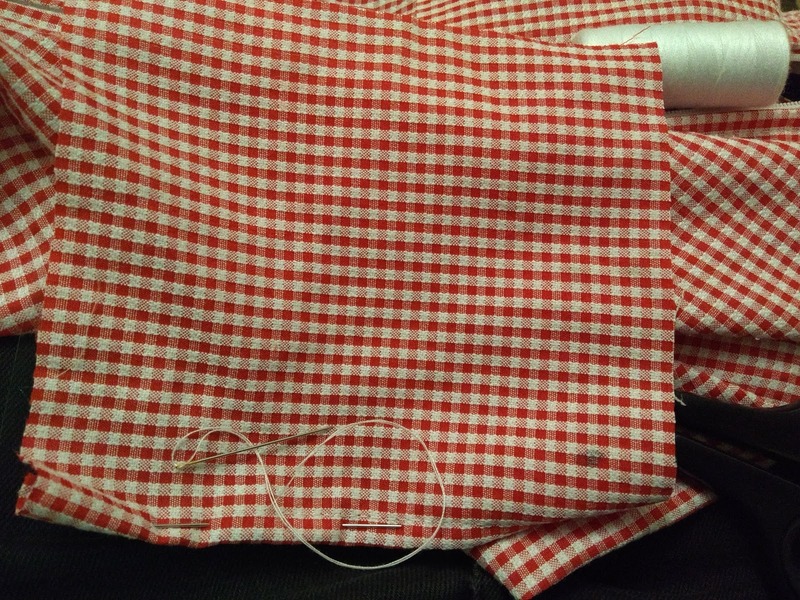 So I decided to do something I've been meaning to do for ages - start making handkerchiefs. 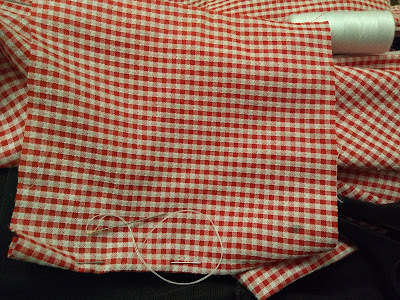 I used a school dress that Girl Child tore last year, thinking that she might like handkerchiefs that matched her uniform and that the gingham pattern would make it easier for me to cut straight! I've only managed one so far and it was pretty tiny so I need to work on my sizing, but it was fine for Girl Child to use when she's just generally snotty. I'm hoping once I've practised more with the gingham I'll be able to make more out of other old cotton clothes that are torn or too stained to wear. This felt like quite a fitting way to round off my year of green. On 30th March at 8.30pm people around the world marked Earth Hour, an hour when people are encouraged to switch off their lights. It's a symbolic gesture - one hour without the big light on is hardly going to make much difference to the environment - but one intended to get people thinking about their energy use. We didn't do anything fancy; we were five minutes late starting because Preschooler was being a monkey at bedtime, and then having not been organised enough to dig out candles we just had an early night! But it did make me think that maybe if we went to bed half an hour earlier once a week, it would reduce our electricity use and we'd be more rested too. I'm hoping to keep up with this through the year. So that's it, the last post in this series! It's not the end of my eco-living efforts (in fact in the last few days I've found other things to do to be greener) but now I can do things in my own time and hopefully stick at them when I'm not having to find new stuff to do. I hope these posts have helped at least a few people to see that being greener doesn't have to be hard, even the tiniest changes make a difference! 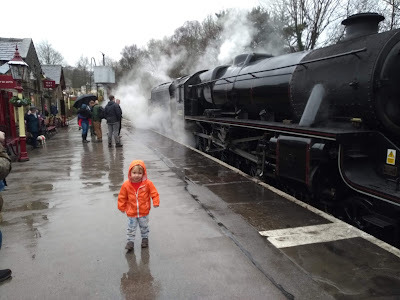 So back at the beginning of February I posted about taking part in the Lovely Gratitude 2019 challenge on Laura's Lovely Blog. I managed January's challenge but February's - to go 24 hours without complaining - just proved impossible for me! Let's not dwell on what that says about me, shall we? Last month's challenge was, on the face of it, far more achievable - posting a picture each week of something I'm grateful for. What I hadn't reckoned on was that March was going to be a difficult month for me, for reasons I won't go into here. It was really hard to stay positive enough to take photos of the nicer bits. But the challenge forced me to remember the positives which did help my mental state a little. My first photo was of Preschooler, whose birthday was at the beginning of the month. I'm grateful that I've been able to spend three years hanging out with him, although it can be intense being mum almost all the time I know I'll miss this time with him when he starts school next year so I'm treasuring it while I can. My second photo was of a box of books I won in a World Book Day competition run by Bloomsbury Kids. 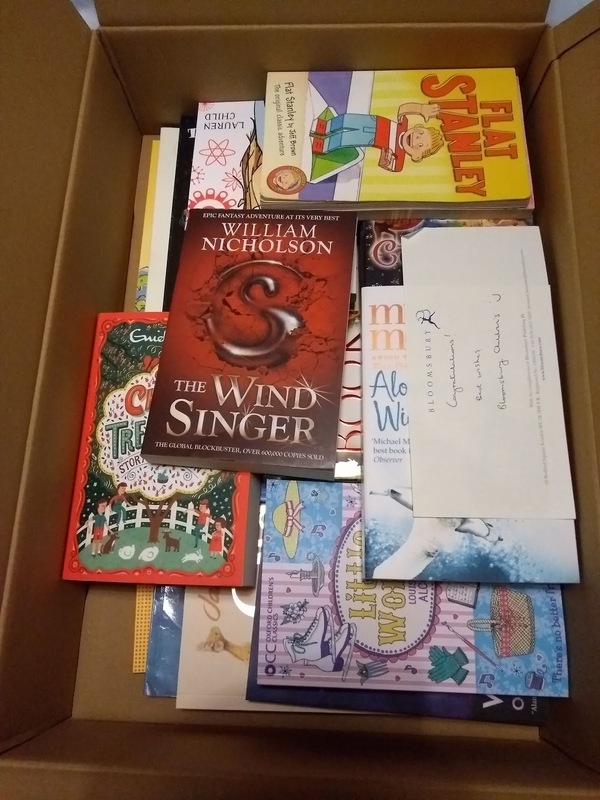 There are books of various age ranges in there meaning I could give both kids some new ones straight away and hold some back for when they're older. I'm grateful not only for these books, but for books in general, and the enjoyment they bring to all of us. 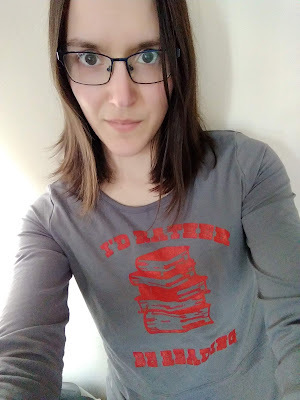 Staying on a bookish theme, my birthday was mid-month so I used some of my birthday money to buy myself this top I've had my eye on for a while from Mama Feels Good. I'm grateful that I had some spare money to treat myself and cheer myself up in an otherwise tough week. 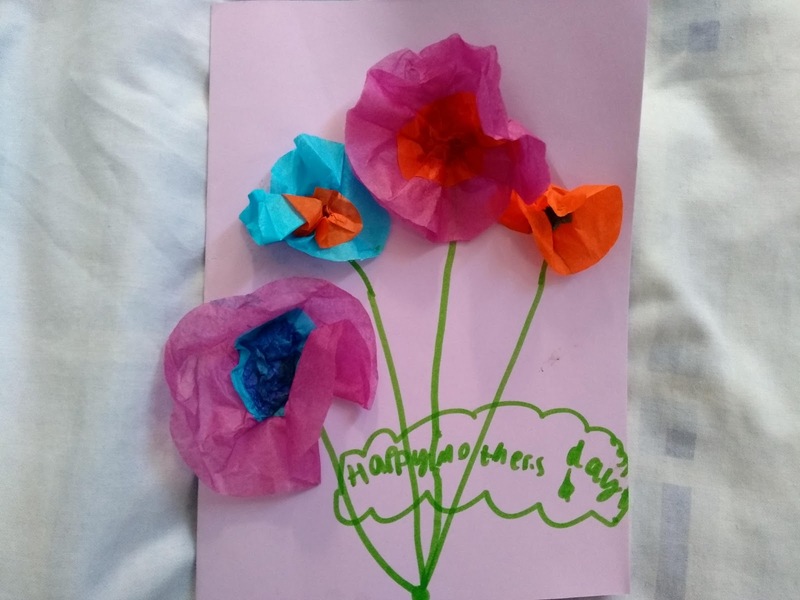 Finally, Girl Child made me this lovely card for Mother's Day and reminded me of just how sweet and loving she can be. I am grateful for her, the child who made me a mother. She challenges me a lot, often more than I feel I can cope with, but she's capable of such kindness, humour and amazing achievements and I love her for that. I'm really glad I stuck with the challenge this month, because it wasn't an easy month and having to find a positive point in every week helped me to remember that things weren't all bad. This month's challenge looks tough again but I'm going to give it a shot - although I have to admit it's not going well so far! 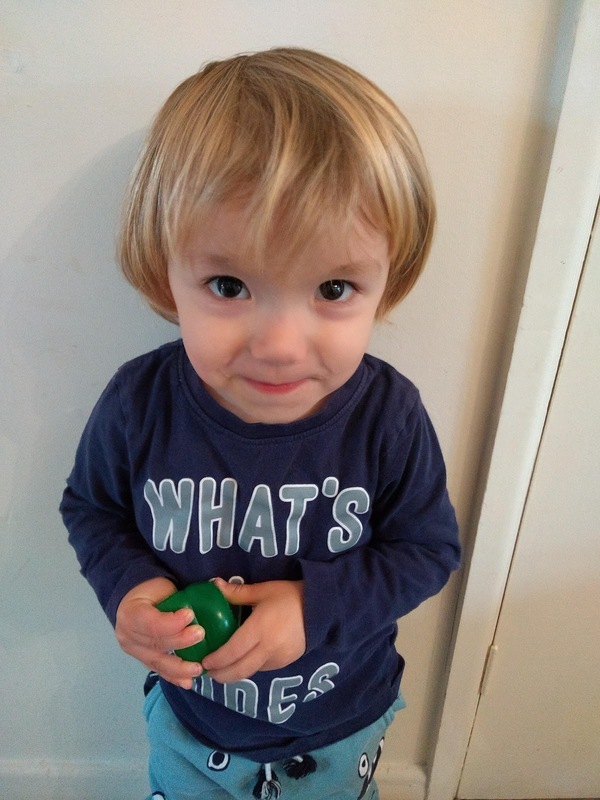 Toddler turned 3 on Monday. So technically he isn't a toddler anymore - in official terms, he's a Preschooler. Except, he's not at preschool. And at the moment I don't think he'll ever go. There are various reasons for this. One is that I'm just not sure he's ready yet - his speech has come on lots in recent weeks but can still be hard to decode, so I worry that he would struggle to communicate with staff and other children at preschool. Also he can get distressed if I leave him with someone else, and while I know that's common and something a lot of kids work through, I just don't feel like pushing it when I don't need to. Which leads me to me. Circumstances are very different now to when I put Girl Child into preschool. I'm no longer trying to work from home so don't have a pressing need for childcare. Also, I'm finding this stage a lot easier now. He's a much more mellow child so I don't feel as exhausted trying to meet his need for stimulation as I did with Girl Child. And of course, he's my last child. I'll never do this stage again, I'm in no rush to share him yet. But also there's the challenge of finding a preschool that I feel would be right for him, and for us as a family. Girl Child went to two different settings - one, a preschool, from just after her third birthday until just before her fourth, and then a school nursery until she started school. She didn't have the smoothest of times at either but the preschool was far better for her, and I'd envisaged sending her little brother there too. However, that now only takes children from 2 until the September after they turn 3. So if I put Preschooler in there now he'd only have a term before he would be expected to move to the nursery class, which was much more formal and structured and not at all what I think he needs. I'm strongly in favour of a relaxed, child-led approach as opposed to focussing on getting children 'school ready'. Different families have different feelings about this and that's fine, but my gut tells me he wouldn't be happy in a more structured setting yet. So where does that leave us? At the moment I'm thinking of finding a childminder for a couple of days a week from September, as I think the smaller, more homely environment would be better for him. For now though, I'm just going to carry on enjoying having him at home with me. I'm very aware that not many parents have the luxury of being able to stay at home and I want to make the most of it before I have to give him up to school five days a week. Is there anyone else whose preschooler doesn't/didn't go to preschool? What did you do instead? My kids are obsessed with dogs at the moment. Girl Child has gone from being terrified of them to wanting to stroke and talk to almost every one she sees (unless they're off the lead, then she still gets very frightened). Toddler has always loved dogs and squeals with excitement when he sees them! 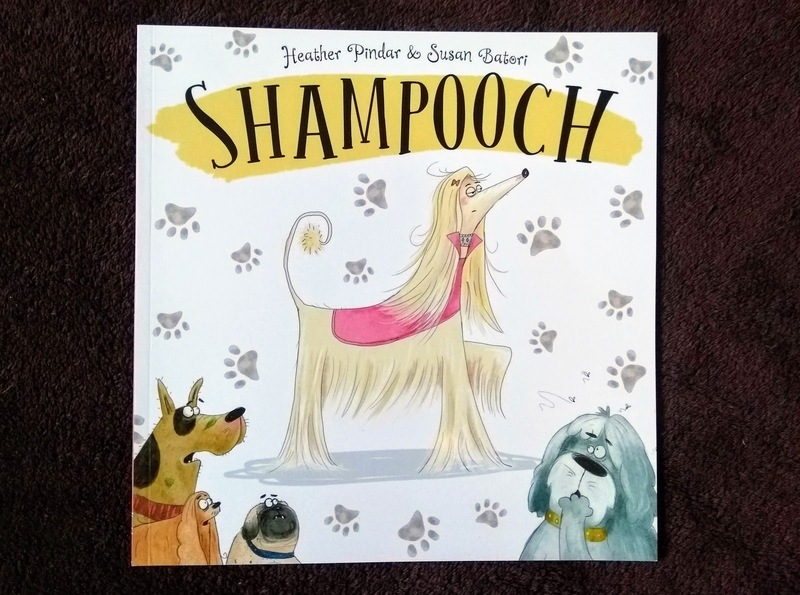 So I was really happy to receive a copy of the latest picture book from Maverick Children's Books, 'Shampooch'! Shampooch is a very pampered pup indeed, her owners lavishing all kinds of expensive beautifying treatments on her. I won't spoil the ending, but let's just say Shampooch discovers that getting messy can be lots of fun! This is a really fun book which would definitely appeal to young dog lovers. It would also be a fantastic book to read with little ones who seem anxious about getting messy, to show them it can be fun and that there's more to life than looking smart. My only slight reservation is the negative reactions of the owners, which might put children off getting dirty, but this would be a good talking point for parents to explain when it is and isn't OK to get messy, and why dog owners might react differently to parents (it's easier to take off muddy clothes than it is to clean muddy fur, for instance!). 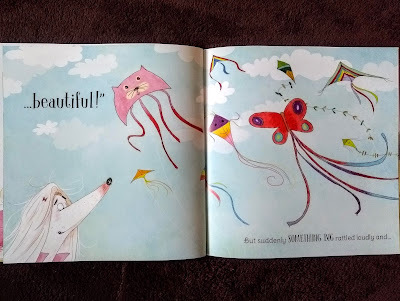 I really enjoyed reading this book with Toddler, there are lots of brilliant onomatopoeic words that make it lots of fun to read aloud, and he loved looking at all the funny dogs! Yet again, Maverick has delivered a book with appealing and amusing illustrations to complement a witty, wacky and well-crafted story. DISCLAIMER: I was provided with a copy of this book for review, but all words and opinions are my own. 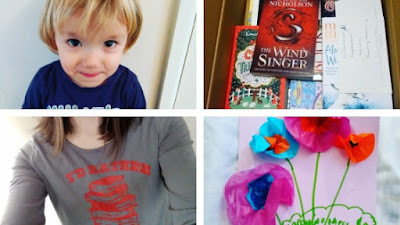 Linking up with #ReadWithMe hosted by Mama Mummy Mum and Kids Love To Read #KLTR hosted by Laura's Lovely Blog, BookBairn and Acorn Books. I've got to be honest, dear reader, these posts are getting harder to write. 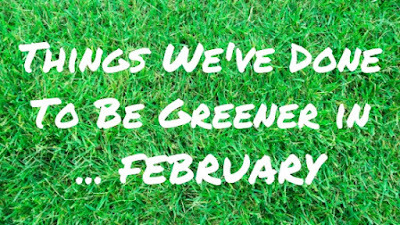 This is in part because I've been documenting our eco progress for 11 months now and starting to run out of ways in which I can make our life greener without significant expense or hassle. 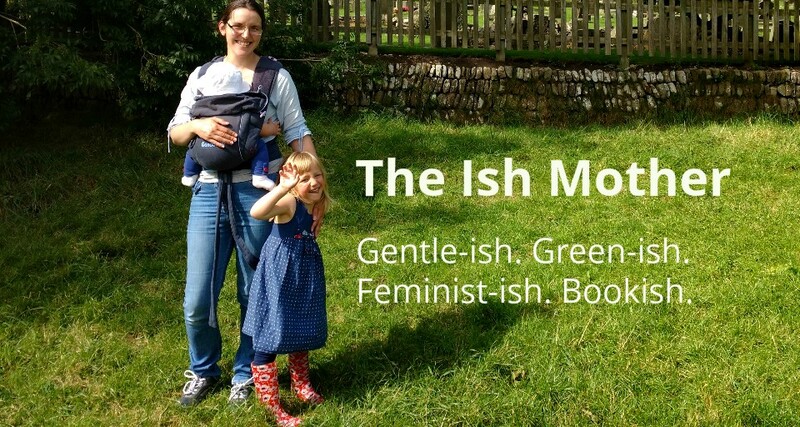 And, leading on from that, I'm at a stage where I feel I need to focus on other things, especially in terms of parenting, and that means I don't have a lot of time to face the hassle. Therefore I've come to a decision that next month's post will be the last of the series - one post for each month of the year. If you have any suggestions of things we can do in March then please let me know. A small act, but still a way of reducing waste. We have an old chocolate tub full of colouring stuff in our house and it was at the point where it was over 50% filled with broken crayons. 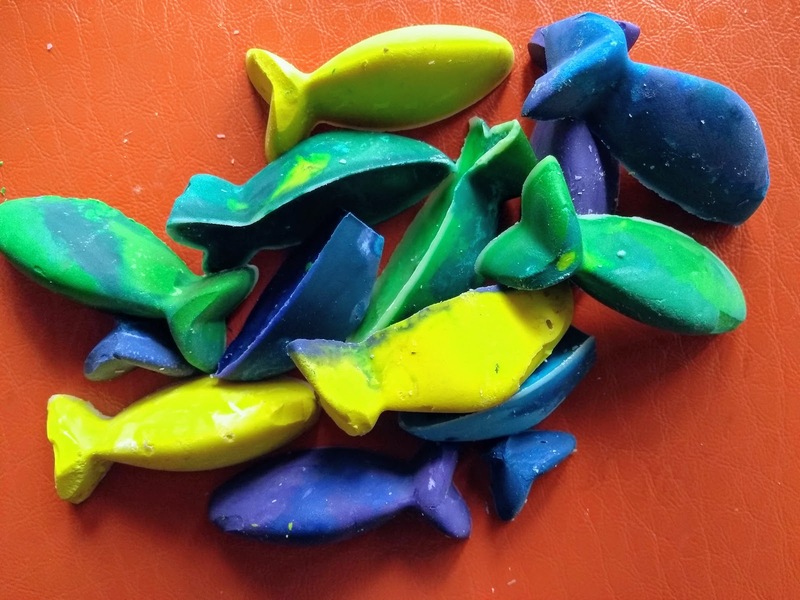 So, following Captain Bobcat's really helpful guide, I sorted them into colours and melted them into cute fishy crayons! Admittedly I still have a few colours yet to do, but it feels great to have decluttered the colouring tub without just binning the broken bits. And Toddler seems to prefer the chunky size of these crayons too. Win! One areas I was struggling with was my dishwasher. The tablets we were using either came in plastic wrappers which aren't recyclable in our area or were coated with what I suspect is soluble plastic - and of course, releasing microplastics into the water system is a Bad Thing. I had intended to start using dishwasher powder instead but actually couldn't find any in our local supermarket! Luckily our trusty zero waste shop came to the rescue as they stock Ecoleaf tablets, which at least claim to be fully plant based and environmentally friendly. They're pricier but I can live with that. Also, my husband is getting in on the act and found an Ocean Saver bottle and pod at the supermarket. The idea of this is that you buy a bottle containing a pod of concentrated cleaning product, mix it with water at home then just buy new pods when you've run out. Again, this makes me a little concerned about the possibility that the soluble skin of the pods are made of plastic, and frustratingly I couldn't find any clear answer about this on their website, but from the perspective of reducing packaging and reusing the bottle, I think this is a great idea. So, that's it for my penultimate monthly eco-friendly round-up. Let's see what fabulous green swaps I can find this month for the last one! You know you're a competition addict when you receive a package and have no idea where it's come from! That happened with me just before Christmas, when a gorgeous hardback book arrived. I'm pretty sure it's not a review copy, it didn't look like someone had sent it as a gift, but I also wasn't contacted to say I'd won it. So I'm just going to assume it was from one of the many book giveaways I enter, and write a review anyway because it's just so pretty!! 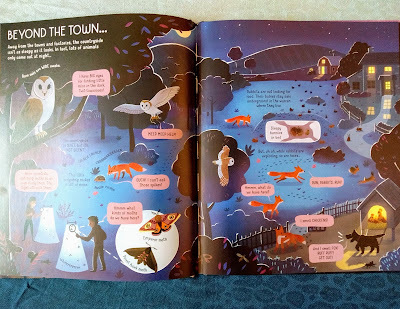 'The Usborne Book of Night Time' is exactly what you'd expect and so much more. It's an exploration of what happens when the sun goes down in different places - the city, countryside, even in factories and the ISS! 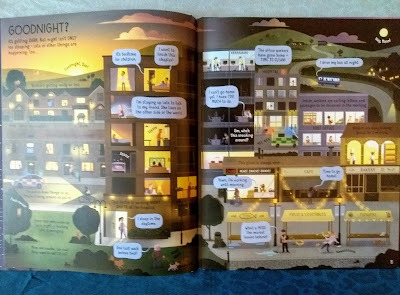 I love this first spread, not only for all the little details but also because it shows how different jobs involve working at different times. I imagine this would be really good for children of shift workers, to see their family represented and understand how their parents' routines differ from others. I also love that it shows families in an apartment block - so often you see family life represented in big suburban semis, so it's great to acknowledge different family homes. I was really torn about which spreads to show in this review as they're all gorgeous, but I really love the colours in the sea illustrations. 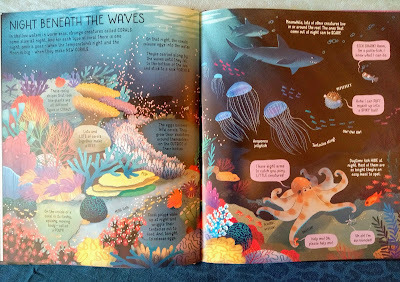 I found it rally fascinating reading about coral, there are facts in there I didn't even know! 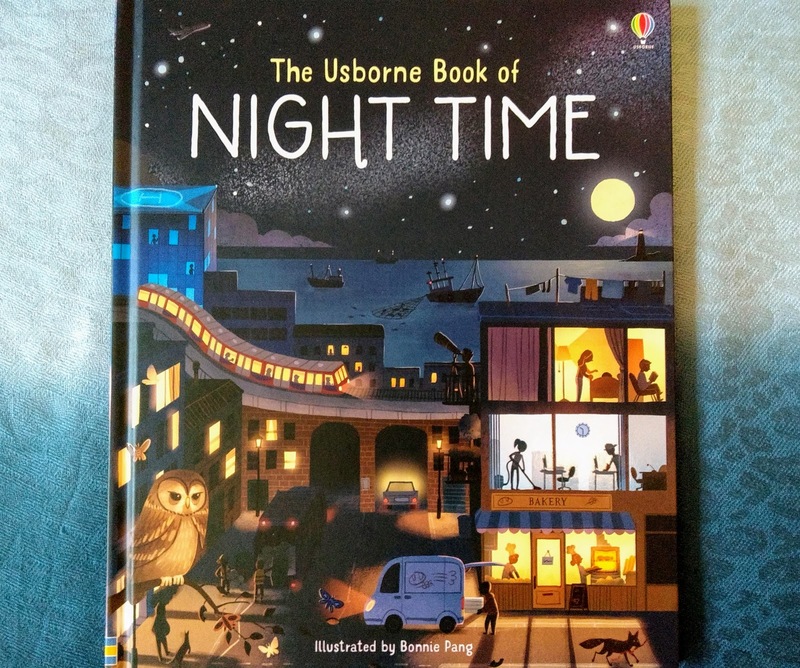 This would be a fantastic book for preschoolers and early school-age children to learn about all sorts of different topics through the uniting theme of night time. It may even make children who are afraid of the dark feel a bit better about the night time by exploring it more deeply. 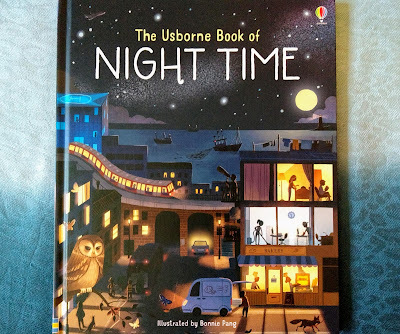 I've only scratched the surface in this review - there are pages about night time in other parts of the world, covering topics such as transport, astronomy and space exploration too. There really is lots to learn and discuss in this book. I'm really looking forward to reading it with Toddler when he's a bit older, at the moment he doesn't really have the attention span or understanding but I think it'll be a great book to explore together in a few months time.